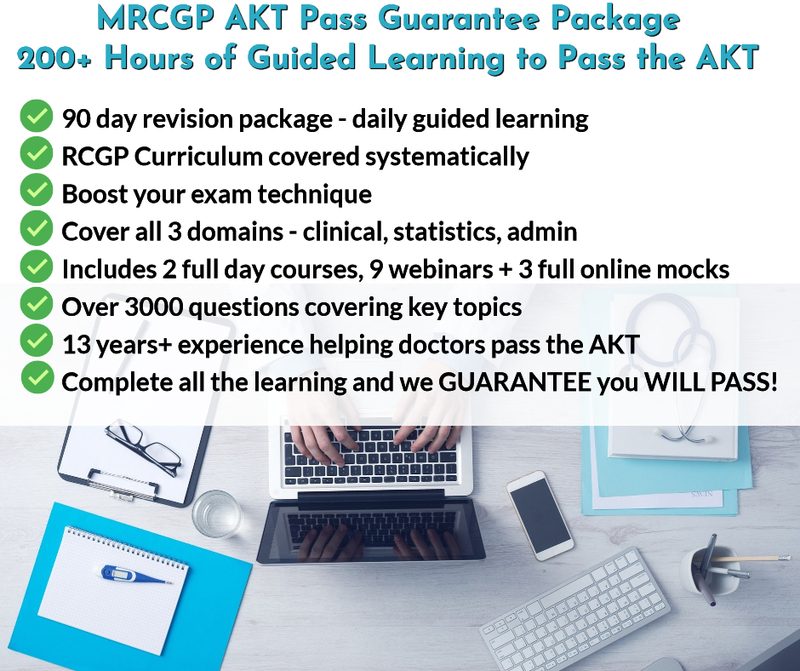 MRCGP AKT Pass Guarantee Package - May 2019 - Save over £300! Includes MRCGP AKT course + AKT 200 Crammer + 8 x AKT Webinars + 3 months access to AKT online + Clinical Case Cards + AKT mocks- worth over £1200! MRCGP AKT Pass Guarantee Package - October 2019 - Save over £300! 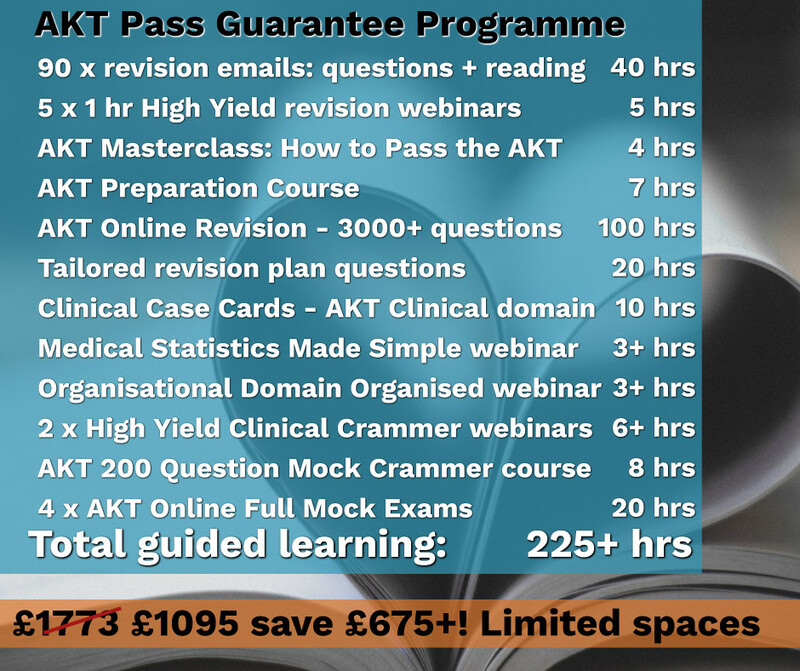 Includes MRCGP AKT course + AKT 200 Crammer + 8 x AKT Webinars + access to AKT online until the exam + Clinical Case Cards + AKT mocks- worth over £1200! How does the guarantee work? Simple - you have to allow at least 75 days of daily study, to go through the planned revision we send you. You have to complete all the questions we send you, attend the 2 full day courses, 8 webinars and go through the case cards. We have done the planning and spent hundreds of hours reading and condensing key guidelines in a way that will allow you to cover the curriculum in 175 hours of study. As well as the 130 hours of Emedica material, you will also be sent reading from other sources. As long as you have read each email within 24 hours of delivery, done the work sent to you, and attended all the live courses and sessions, we are so confident that you will pass, that if you don't we will refund you every penny you paid, or allow you to reattend everything for the next sitting for FREE - your choice! We are confident you won't need it though, as the package is designed so that you will be prepared to not just pass, but to fly through your exam! Please note, the programme does need you to commit to study every day for 75 days, including an average of 1.5 hours a day during the week, and 3-4 hours each day on the weekend, as well as attend all the live teaching (either in person or via live stream). Dates for May AKT programme (now full) are shown below. The October programme will start from 1st August 2019, however you will get access to the 1st Webinar and the online revision questions within 1 working day of signing up. If you are unable to commit the time, or cannot attend, then this package is not for you. The Course Director and main speaker is Dr Mahibur Rahman. He is a Portfolio GP in Birmingham and a Consultant in Medical Education. He has helped thousands of doctors succeed in their Membership examinations since 2006 and passed his own MRCGP with merit. You can find out more about him HERE. "Excellent course, liked the course material and the booklet covering the core knowledge and topics." "Very good handouts + notes. High yield topics very helpful, liked mock exams - helpful for time management"
"Stats and health informatics very good"
"Mock exam gave idea of real time and format of exam. Useful tips on revising and areas highlighted by examiners." "Excellent course, I liked the Hot topics - Dr Rahman always makes things so simple!" I found your course very helpful, and it clearly worked as I passed the AKT exam on my first sitting with an overall score of 87.5%. I found the course and mock exams very reflective of the real exam. I got amazing results, overall 86%. 95% in evidence interpretation, 100% organisational domain, 83% clinical. Mean mark for the cohort was 72.38% and pass mark for this paper was 67.5%. I have found your practical tips on OSCE type stations for application far more useful and feel that your CSA courses will probably be equally as useful. Thank you for your ongoing hard work and support. I'll do doubt be back in contact at CSA time in autumn 2019. I have passed the exam with 81.5% score. Thanks for the great course and tips for the exam. I have scored 85% in statistics to which the course has contributed to a lot. I passed with 80% Thank you for your tips. I have passed with a good score, and achieved 80% in both my organisational domain and statistics. Huge thanks to you and your incredible resources for helping me pass this exam. Thank you for your help with the Akt. I attended the akt masterclass and had been doing questions on emedica and also followed your high yield webinar. I am so pleased it all worked out. Your statistics and organisational bits in the masterclass really made a difference. I scored 75% in those two and despite a lower mark of 66% in the clinical I passed. Thank you for your tips in statistics. I passed with 74% marks. I am so glad, I could never have done it without your help. I am grateful for your help. So happy to share the news that I passed the exam on the first attempt- for someone who was very upset as made few silly mistakes! Many many thanks for all your guidance and help, really helped me get a strategy for the exam and keep me steady throughout the process! Your message towards the end of the 30 day challenge "you are nearly there- just keep going" really helped my insane mind in the last few days giving me the much needed boost. You are doing such a brilliant and great work! Thank you for all your support for the Akt preparation. I passed! So pleased. It was my second attempt and found your course and webinars very helpful. I will definitely be recommending your courses to my friends. Thank you for your continued support and guidance. I am happy to tell that I have cleared my AKT in first attempt and I shall look forward to your support and guidance for CSA. I am pleased to say I passed the AKT . The AKT course and webinars were really helpful, enabled focused reading. Thank you so much for your help and to your team. Passsed my AKT. I was glad to do full day mock 200 question crammer course. Your admin was simple and easy to remember. Just to let you know I passed the AKT exam. Thank you so much for your excellent work. I couldn't have done it without you. Just wanted to.let you know that alhamdulilah I passed the AKT exam, after my third attempt . Thank you for your support and guidance, your online examination banks were the most useful for sure. I passed the exam and definitely the material and stuff you went through helped me to pass the exam. I'm happy to say I passed with a score of 85.35% overall Alhamdulillah, your one-day course and online resource was helpful alongside pass medicine and the recommended book on statistics. I am pleased to say I passed on my first attempt with 82.8%... Also you'll be pleased to know I got 100% on the statistics component! Alhamdulilallah I passed, scoring 81.81%! Thank you so much for your valuable advice. Many thanks for all your help. Passed at my first attempt. 78.28% overall achieving 90% in stats and 95% in the organisational domains. Your revision video crammer modules which I used in my final days of revision absolutely helped with my last-minute consolidation and certainly my exam technique. Thank you so much Dr Rahman! I Passed the AKT with 78%. I am so relieved, happy and grateful. Couldn't have done it without the teaching, webinars and your support. I am delighted to inform you that I passed my AKT with a score of 76.26% thanks to the excellent assistance from Emedica. This is much appreciated. The interactive component was also good as it kept one engaged during the session. I also used your online questions/AKT package and found that bursts of 20 questions was ideal. Explanations were also concise and had the key information needed! I just wanted to thank you for getting me through the AKT! Honestly, I thought I could never get through this. My scores this time was 73.73%. So just made it! This could not have been done without your support and your help in my preparation. The webinars were fantastic. Alhamdulillah I passed the exam with a good score! Thank you for all your support and revision sessions. The webinars were particularly useful. I passed! Thank you for your courses, webinars and online question bank ...I did the lot and it certainly paid off! I'm thrilled. I passed AKT this time and thanks to you for all your help, advise and support in this journey. Will be in touch for final CSA preparation. I have great news to share that I passed my AKT. Many thanks for all your efforts, may Allah reward you for them. I passed thanks to Emedica support. The mock at the end was very helpful. I just got my result and I passed. I can't thank you enough for your help. I wouldn't have been able to study effectively and pass without your help. "I am glad I used the Emedica AKT mock few weeks before the exam. That helped me to make my revision smarter during the last weeks. I have a pass with good score, got 85% in statistics and 90% in organisation. " I passed the exam Alhamdulillah and scored 85% on stats. I found the Emedica course gave me a good overview of what was needed to prepare, and the booklets and high yield topics were very useful pointers to ensure important topics were covered. The stats lecture was very useful too. "I just wanted to let you know that I found your online preparation tools and the course very helpful! I managed to score 81%! " "Just wanted to let you know that I passed AKT with over 80% overall. Thank you for your help. The course made a huge difference and helped greatly. You've helped at every stage of my GP career, from pre application to Stage 2, 3 and now AKT. Looks like I'll be joining you for CSA when the time comes too!" "Thank you very much for the course, materials, YouTube videos and generally supportive emails. I am so pleased to let you know I passed with a score of 80% across all areas. Such a relief." "I passed the AKT with a score of 73%.It was also great undertaking your CSA course in Birmingham earlier this month. Found it helpful and hopefully it has given me the skills I need to pass my upcoming exam. Have stuck with Emedica from the beginning and hopefully it will see me beyond training." "I passed 72%! I used Emedica questions for first time for AKT and found them close to exam format! " "I passed my AKT with a better mark than I could have imagined, and I am so grateful to Emedica because I know the course had a massive impact on how I structured my learning and revision and helped me organise myself and focus on key areas. The AKT mock exam was realistic and helpful to do the week before the exam as well. I would highly recommend the AKT course to others and will definitely use Emedica for future CSA preparation." "I have passed by the grace of God. I would like to say that Emedica really helped me tailor my revision. Thank you so much for your course and 30 days high yield videos."